Calling all ale aficionados, porter professionals, stout scrutineers, cider critics, perry pupils and those of you that just like a damn good pint. Over the August Bank Holiday we will be hosting our annual beer festival. This year is set to be as fantastic as ever. We will have an exquisite selection of beers, both local and from further afield. But that’s not all, there will be live music every day and some delicious home cooked cuisine, all set in our marquee and beautiful village pub. Please join us on the 26th – 28th of August for an unforgettable weekend. So keep the cover on the barbecue, tell the in-laws you’re out of town, chuck those running shoes under the stairs and cancel that bland lunch in yet another gastro-pub. 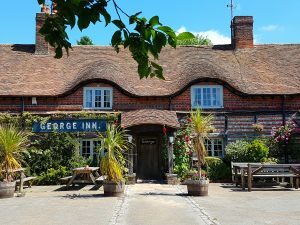 It’s The George Inn Beer Festival!!! Where else in the world would you rather be?